You are currently browsing the Carpe DMM blog archives for March, 2015. We are at Barcelona Airport, waiting for our flight to Dubai. We arrived here nice and early so have a couple of hours to kill before boarding. We got up this morning at 07:15 to give us plenty of time to get to Parc Güell for our pre-booked 09:30 entrance to the monument zone. We showered and then went out to the Forn del Cel cafe again for a quick breakfast. The woman there recognises us by now, but we were too early today for the cañas to be ready after baking. M. got a cereal croissant with a little packet of peach jam to put on it, while I got a croissant with ham and cheese slices inside. The woman asked us if we were out for an “excursio” and we said we were going to Park Güell and then the airport. Clearly nobody in Barcelona gets up that early and has breakfast unless they’re doing something unusual. 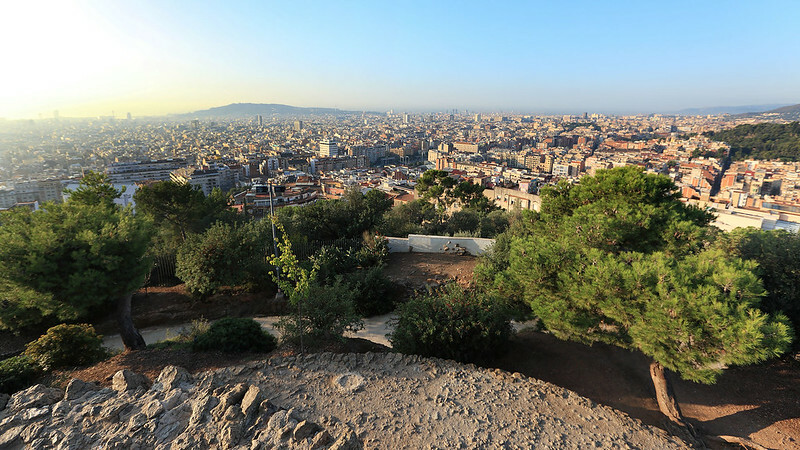 View of Barcelona from Parc Güell. We have stopped for a drink in a small cafe, Cafe Reunion, just outside the marketplace of the neighbourhood village of Gràcia. 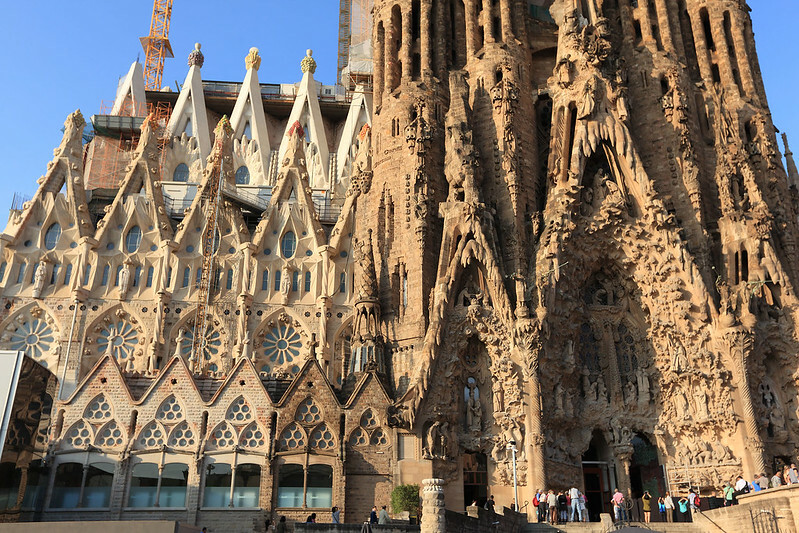 We got up at 07:30 to shower and leave early so we could make it to the Sagrada Familia cathedral in plenty of time for our 09:45 admission. We had a quick breakfast in the same cafe Forn del Cel as yesterday, this time ordering a caña each, a custard one for M. and a chocolate one for me, which was rich and sweet. My Spanish is slowly getting better, though of course they all speak Catalan here instead, so I’ve started to adapt to that, with “gra-sya” rather that “gra-thyas“. From the cafe we walked the additional block to Urgell metro station and caught the train to Sagrada Familia. We are sitting at the restaurant Bon Marisc on the Passeig de Joan de Borbo, which runs along the marina waterfront in Barceloneta, the seaside and beach suburb of Barcelona. We’ve spent all day walking to get here, and are about to enjoy some paella to finish the day off. The restaurants along here all seem to be open early, catering to passing tourist traffic, with spruikers encouraging anyone waking past to sit down and eat. We began with the alarm at 08:30, giving ourselves a bit of a sleep in, since 07:30 felt really early yesterday. After showering, we left the hotel, deciding not to have the hotel breakfast, which costs something like 18 euro each. 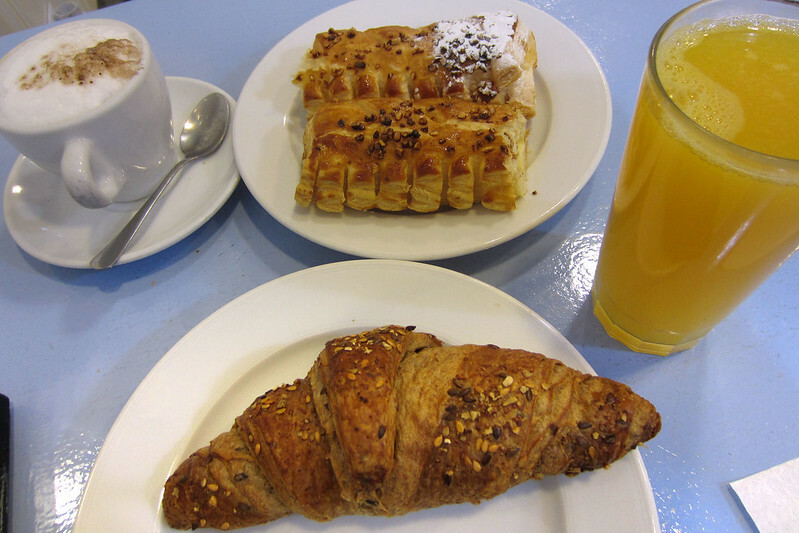 Instead, we found a small bakery/cafe called Forn del Cel, where we got a caña (a long roll of pastry filled with custard) and a croissant cereales (essentially a whole grain croissant), plus a cappuccino for M. and an orange juice for me, for a total of €6.90. I even used the right word for juice this time: “zumo”. Breakfast at Forn del Cel.